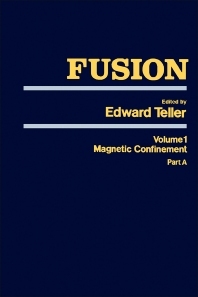 Fusion, Volume I: Magnetic Confinement, Part A is the first of the two-part volume that covers the complexity and application of controlled magnetic fusion. This book is divided into seven chapters and starts with a brief historical overview and some properties of controlled fusion. The subsequent chapters deal with the principles, thermodynamic stability, and configuration of Tokamak plasma. These topics are followed by discussions of the variations and application of stellarators; the concepts of mirror theory; and the establishment of the experimental basis of the mirror-confinement physics. The last chapter focuses on the principles, configuration, and application of the reversed-field pinch. This book will prove useful to physicists, physics students, and researchers.